Vancouver Real Estate functions like any asset class. Buyers, particularly investors, are chasing returns and looking for a safe place to park their money. This is even more pronounced in an environment where central banks are printing trillions of dollars and suppressing interest rates. This is why we have wealthy people land banking, it’s effectively more prudent to buy land and watch prices inflate than having it depreciate in a bank. With this in mind, keeping an eye on dollar volumes is pretty important. It tells you how much money is flowing into Vancouver Real Estate. More money pouring in chasing fewer supply equals higher prices. And obviously, less money spent is the first sign of a potential reversal. 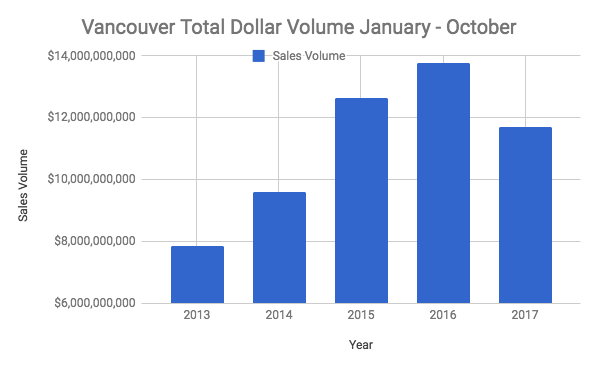 As you’ll notice in the charts below, Vancouver dollar volumes spiked in 2014 and 2015, essentially kicking off our housing boom. This is virtually in line with the hundreds of billions of dollars which flowed out of China as their currency depreciated. As you can see, total dollar volumes exploded upwards by 22% in 2014, and 32% in 2015. Then in 2016, dollar volumes barely increased, experiencing just 9% growth. Today, dollar volumes are reversing, plunging 15% year to date. This is likely a combination of China capital controls, a foreign buyers tax, and overall market exhaustion. But when we peel back the numbers further we can get an even greater understanding of exactly what’s going on, and how capital is moving. The expensive detached market has softened big time. Dollar volumes are in the gutter, dropping 28% this year after experiencing 25% growth in 2014 and 30% growth in 2015. So who is buying, and what are they buying? As has been well documented, condos have become all the rage. Buyers are no longer bidding up land prices as they were in 2015 and 2016. This feels an awful lot like market exhaustion, as local buyers are buying what they can afford after prices jumped upwards over the past few years. 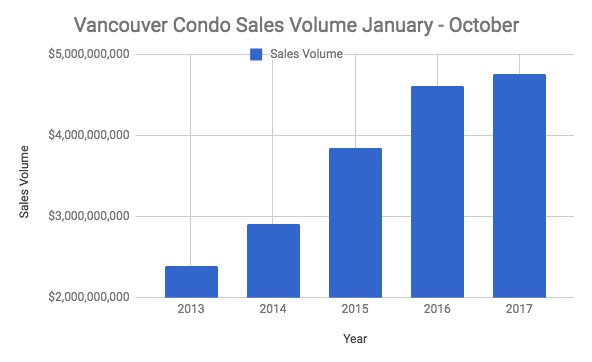 Condo dollar volumes are still increasing, up 3% this year. Yet despite prices growing by 14% this year it appears capital is drying up. 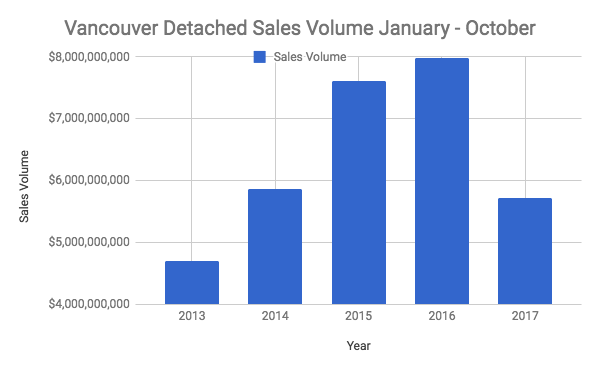 Peak capital sloshing into Vancouver condos has slowed from it’s 20% growth last year, and 32% the year previous. With mortgage standards set to tighten in 2018 I’d imagine dollar volumes will continue to taper as capital becomes harder to obtain.